Sekiro: Shadows Die Twice makes you rethink everything you know about boss fights. My plan for beating the Guardian Ape was to stay well away from its foot stomps and ground smashes, occasionally sprinting in for a few quick strikes. It worked up to a point - until it picked up its own poisonous poo and flung it across the arena, claiming half my health bar. After an hour of frustration, it finally clicked: I’d only win if I was aggressive. Instead of jumping back when it attacked, I pushed forward to parry its swipes and cut at its legs. Eventually, it flopped on the ground looking as exhausted as I felt, and I sliced its head off. Five seconds later it rose again, head in one hand, makeshift blade in the other. Round two. In Sekiro, you play a shinobi trying to rescue your kidnapped master, a young boy called Kuro with a magical bloodline. You spend most of your time cutting down bosses and minibosses across a huge, branching world - so it’s a good thing the combat is genius. It’s possible to kill enemies by whittling down their health bar with your katana, but the game’s defining moments are its stylish “death blows”, which you can only deliver once you’ve broken an enemy’s posture, displayed as a bar alongside their health. Every time you successfully parry an attack or force an enemy to block you, you damage their posture, and once the bar is full you can finish them off in one attack. Enemies recover posture if you let up, but the lower their health, the more posture damage they take, and the slower it recovers. To kill bosses you’ll therefore need to apply constant pressure, dealing damage, parrying attacks and forcing them to block. That aggression puts you in danger. Most enemies in Sekiro can kill you with a couple of hits, and you’ll die hundreds and hundreds of times, including to regular swordsmen. It took me more than 20 attempts to best some bosses, and yet it rarely feels unfair. Every time I died, I know I could’ve survived if I was less tentative, or if I’d studied my enemy’s attack patterns closer. "You’ll die hundreds and hundreds of times, including to regular swordsmen"
The lethality of your foes combined with the power of your parry creates a brilliant tension between safety and success. Backing off usually preserves your life but doesn’t help you kill your enemy - pushing forward puts you in range to cut them down, but makes you vulnerable. I’m always playing right on the edge of my abilities, and the thrill of knowing I could die from one mistimed parry makes every victory feel huge. It’s more punishing than either Dark Souls or Bloodborne, but more rewarding too. No two fights feel the same. As well as the haunted, headless ape I’ve fought a drunkard that periodically swigs poison and spits it on his sword, a charging bull with flaming horns and something named the Long-arm Centipede Giraffe. A host of gadgets for Sekiro’s prosthetic arm adds further variety, and they can help you in sticky spots. When fighting the bull, I equipped the firecracker, which stuns beast. When I battled a chained ogre, I blasted my flamethrower, because I’d heard enemies say it feared fire. Outside of combat, poetic writing and a vast, branching setting make Sekiro a joy to explore. Its story is more straightforward than FromSoftware’s previous games, which is a good thing. Your aims change as you progress, but each time it’s clear what you must do, and it gives you a constant sense of purpose. Away from the main story, Sekiro’s world is a mystery that begs to be explored. You’ll meet an old woman mumbling about rice and a snake, a diminutive warrior called the Black Hat Badger who talks about flying a kite and a sad monk who’s crying because he’s lost a pure white flower. Whether or not you can work out how to help these NPCs will change your story and send you to bits of the world you might’ve otherwise missed. The environments can feel samey early on, and you’ll spend hours hopping across the roofs of cut-and-paste pagodas. Later locations are more varied, if a little uninspiring—I never saw anything that made me stop and stare. But they’re still fun to poke around thanks to the secrets tucked away behind hidden doors and in tiny cave entrances. You’ll find prayer beads to upgrade your health, gourd seeds to give you more refills of your healing flask, and new attachments for your shinobi prosthetic. It seems to keep expanding, too. Every time I exhausted one branch, two or three more would reveal themselves, each ending in bosses. I spent 40 hours with my first playthrough and there are still storylines, including another ending, that I’m planning to catch the second time around. Unfortunately, it’s let down by its emphasis on stealth. 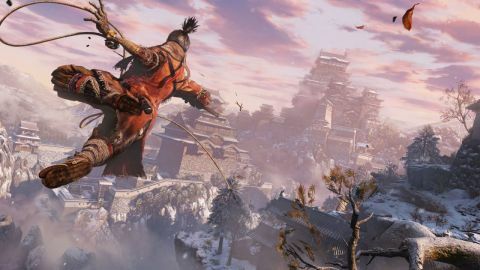 Fighting groups of enemies head-on will get you killed, and Sekiro instead wants you to take them out one-by-one via stealth kills. Guards stand below overhanging ledges or on the edges of tall grass, just waiting to be stabbed. But the AI is too easy to fool, and it makes stealth segments boring. If you hide for 15 seconds, enemies will forget you just skewered their buddy and go back to their posts. It’s satisfying to plan a perfect route the first time you enter an area, but you end up running that same route over and over. One spearman mini-boss on some castle steps, for example, has an honour guard of six enemies, and it’s too dangerous to take them all at once. It creates a tedious cycle of jumping from the roofs, stabbing one, retreating on-high and waiting for the AI to reset. Jump, stab, and repeat. When you eventually get stomped by the boss, you have to go again. Moving in stealth can be awkward, too. You can’t, for example, hurdle silently over low objects when crouched: pressing jump will make you leap out of cover. If you’re on a tree branch, you can’t simply drop down silently - instead, you have to pick a direction and jump. It’s clunky. My only other complaint is with the camera, which can’t deal with tight spaces. I died several times to a shadow warrior in an underground tunnel because I got too close to the walls, which meant I couldn’t see anything other than the back of Sekiro’s head. I was cut to shreds. But as annoying as these issues are, they’re dwarfed by the excellence of Sekiro’s bosses and combat. Give it your patience and it’ll reward you with some of the best fights in any video game, poetic side stories and a world full of secrets. It’s the hardest game I’ve ever completed and yet, as soon as I beat the final boss, I booted up a new game. I’m determined to explore the side stories I missed - and stab that bloody ape in the neck just one more time.